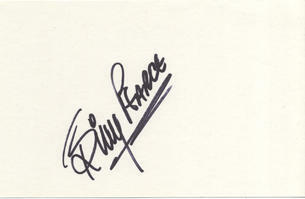 This is an In Person Signed reverse of a Postcard 5.5" x 3.5" by the British Comedian who shot to fame on T.V's New Faces. Billy Pearce (born in Leeds, West Yorkshire) is an award winning English performer, comedian, actor and entertainer. A regular on UK television in the 1980s and 1990s, Pearce has been described as a "supreme entertainer". His summer shows and pantomimes regularly break box office records.